ResxToJs is a MSBuild task that outputs specified keys from a resx file in RequireJS i18n format. 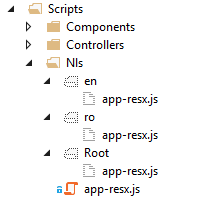 Add a new resx file to your ASP.NET MVC project and name it Resource.resx. Open the file in VS.NET and set the access modifier to Public, now you can add a file per supported language using the naming: Resource.en-US.resx, Resource.ro-RO.resx. Because the *-resx.js files will be generated on each build, there is no need to keep them on the source repository, in order to exclude them from git you can add the following lines to .gitignore file. If you want to retrieve the resources in your client side code you should use the i18n RequireJS plugin that comes with the RequireJsNet.Scripts package. Add the i18n plugin to the paths config in RequireJS.json file. The current culture is determined on the server-side by the System.Threading.Thread.CurrentThread.CurrentUICulture property and attached to the requireConfig global object. The following code should output an object containing the js marked keys from your resx file. For more information on RequireJS.NET features please read the wiki and check out the samples. If you have suggestion or any kind of feedback regarding RequireJS.NET project please submit an issue here.